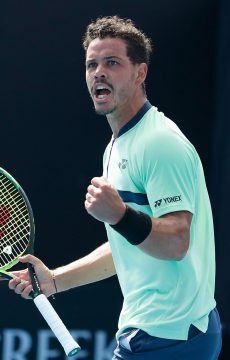 Australian wildcard Alex Bolt upstages former world No.8 to move through to the second round of the Australian Open. 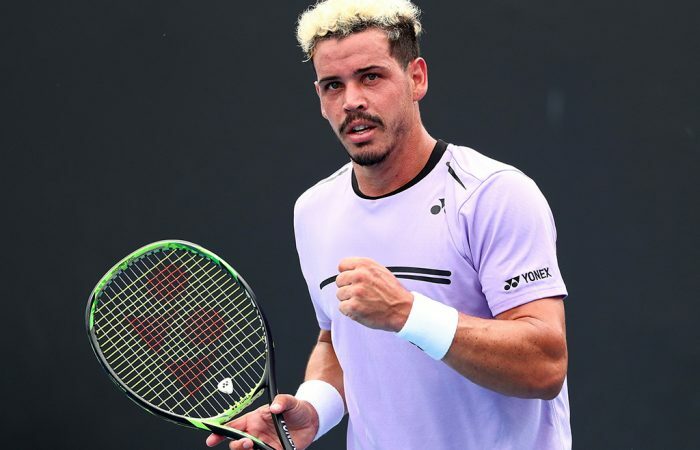 Alex Bolt is celebrating his first victory at a Grand Slam tournament after coming from a set down to beat American Jack Sock in the opening round the Australian Open. The 26-year-old South Australian wildcard won 4-6 6-3 6-2 6-2 on Tuesday to set up a second-round encounter against French No.29 seed Gilles Simon. Bolt’s only previous appearances in the main draws at majors ended in first-round defeats last year at Wimbledon and at the previous two editions of the Australian Open. “It’s a pretty surreal feeling. I went over and gave my mum a bit of a hug, my dad was here, my brother flew over,” Bolt said. Bolt out-served Sock, also a tournament wildcard, sending down 22 aces to 13 and converting six of 13 break point chances. The world No.155 broke twice in the final set to run away with the match in hot conditions. “I’m up there playing the best tennis I’ve played. And I still feel I can play better. So, good things are to come,” he said. Bolt joined countrymen Alex De Minaur, Jordan Thompson, John Millman and Matthew Ebden in the second round. He was the first Australian winner on Day 2 at Melbourne Park after Destanee Aiava and Ajla Tomljanovic bowed out in their opening-round matches. Tomljanovic went down in a heart-breaker, falling 7-6(4) 2-6 7-6 [10-7] to former world No.4 Johanna Konta, while Aiava found 17th seed Madison Keys too strong in a 6-2 6-2 loss at Rod Laver Arena. 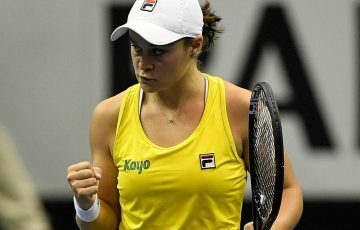 Tomljanovic was left to rue a lack of aggression at crucial moments in the third set against Konta, who embarked on a thrilling run to the semis at Melbourne Park three years ago. “I hate losing in general but here it’s even worse,” said Tomljanovic after falling in two hours and 51 minutes. 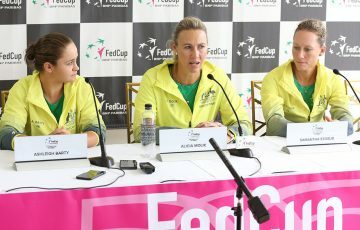 “I had a tough first round, she’s a great player and she played a high level throughout the whole match. “In the third set I was always the one up on serve and I didn’t get any looks at all on her serve. I thought I just hung in there and in the important moments I maybe wasn’t aggressive enough. 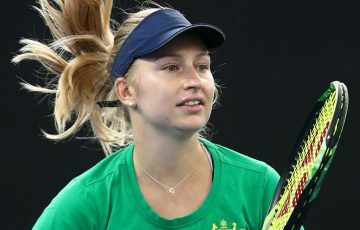 Later on Tuesday, Daria Gavrilova made her earliest Australian Open exit in four years after losing in the opening round to Tamara Zidansek from Slovenia. 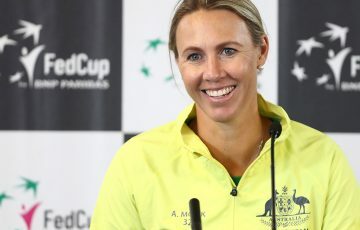 The world No.41, who reached the last 16 at Melbourne Park in 2016 and 2017, was out of sorts and made 38 unforced errors – including 23 on the forehand wing – in the one hour and 44 minute match. “I probably started just overplaying and made a lot of errors. There was a lot happening in my head,” Gavrilova said. At Melbourne Arena, Sam Stosur lead teenage talent Dayana Yastremska 5-2 in the opening set before the Ukranian found her range. Yastremska, a big-hitting 18-year-old who finished the match with 21 winners to Stosur’s 13, roared back to win 7-5 6-2.